Firewheel Holiday Celebration in Garland on November 23, 2013. 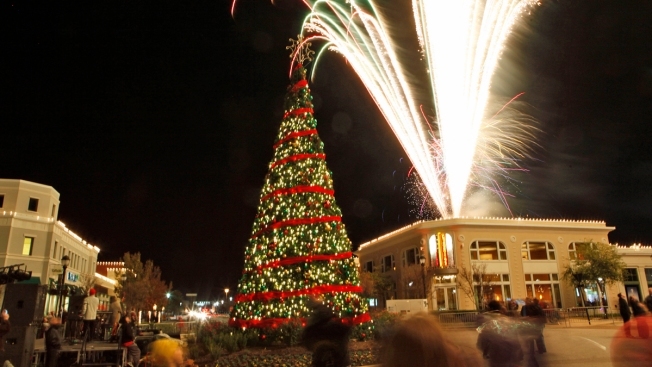 Due to inclement weather in the forecast Saturday, Firewheel Town Center in Garland canceled the lighting of their 41-foot holiday tree on Saturday, Nov. 22. Instead Firewheel Town Center will host a day of celebration on Saturday, Dec. 6, that will culminate with a festive fireworks display. The Dec. 6 day of celebration is free to the public and begins with breakfast with Santa at TGI Fridays from 9 a.m. to 10:30 a.m. (reservation required), followed by Spread the Love/Random Acts of Giving from 11 a.m. to 5 p.m. The Kidgits holiday celebration will be held from 4 p.m. to 5:30 p.m., strolling holiday entertainment will take place from 4 p.m. to p.m. and the fireworks spectacular is scheduled for 6 p.m.
Complimentary carriage rides every Saturday from Nov. 22 through Dec. 20 from 5 p.m. to 8 p.m.
Pet Photos with Santa on Nov. 30 from 6 p.m. to 7 p.m.
Caring Santa on Dec. 7 from 9:30 a.m. to 11 a.m.
Marine Toys for Tots Donation Drive on Dec. 8 from 5 p.m. to 9 p.m.
Minature train rides begin at 2 p.m. and run until dusk every day in the Firewheel Town Center park. For more information visit www.firewheeltowncenter.com.